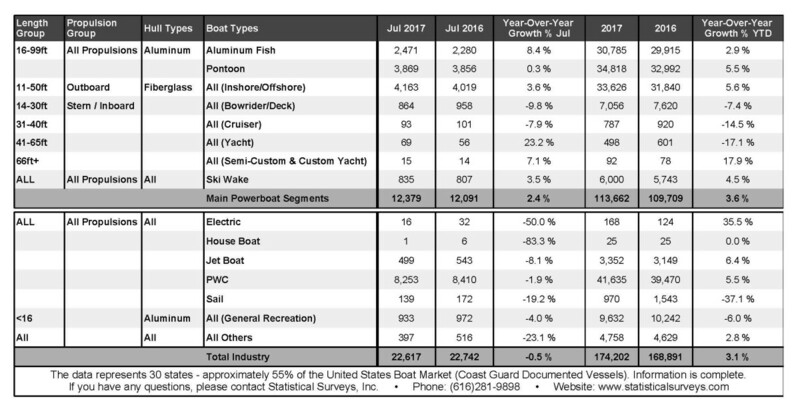 Sales rose 2.4 percent in the main powerboat segments, or 288, to 12,379, but industrywide sales dropped 0.5 percent, or 125, to 22,617 from July of last year in 30 early-reporting states that represent about 55 percent of the U.S. boat market, Statistical Surveys reported today. “We kind of missed the mark in July,” Statistical Surveys sales director Ryan Kloppe said, although he noted strengths for the month in sales of aluminum fishing boats, outboard fiberglass boats and yachts 41 feet and larger. “The main powerboat segments are up,” he said. Boat sales in July of 2016 fell 7 percent in the main segments and 5.7 percent industrywide in 28 states in what was one of the industry’s weakest months of the year. Sales in June this year were up 1.8 percent in the main segments and 1.5 percent industrywide. The industry had its strongest month of 2017 in May as sales rose 8.5 percent in the main segments and 8 percent industrywide. For 2017 through July sales are up 3.6 percent, at 113,662, in the main segments and 3.1 percent, at 174,202 industrywide in the early-reporting states. The results lag industry forecasts for a 2017 sales increase of 4 to 6 percent. Kloppe said the industry has reason to believe sales could rise during the last part of the summer in August and September. “We still have some warm weather ahead,” he said. Fiberglass outboard boats from 11 to 50 feet topped the main segments in sales this July at 4,163, up 3.6 percent from last year. Percentagewise, sales of aluminum fishing boats led the main segments with a gain of 8.4 percent, to 2,471, but sales of pontoon boats, a stalwart industry category since the Great Recession ended, were virtually flat, rising 0.3 percent, or 13, to 3,869. Sales of ski and wake boats rose 3.5 percent, to 835. Through July in the early-reporting states sales of fiberglass outboards are up 5.6 percent, at 33,626, and pontoon sales are up 5.5 percent, at 34,818. Sales of aluminum fishing boats and pontoons and fiberglass outboards all exceed 30,000 through July in the early-reporting states. Sales of inboard and sterndrive boats, which have struggled in recent years, fell 9.8 percent in July, to 864, and they are 7.4 percent lower for the year through July in the early-reporting states, at 7,056. Outside the main segments, sales of personal watercraft, another category that has performed well during the industry’s recovery, fell 1.9 percent, to 8,253. For the year through July sales of PWC are up 5.5 percent, at 41,635, in the early-reporting states. Sales of jet boats dropped 8.1 percent, to 499, but for the year through July that category is also an industry bright spot — up 6.4 percent, at 3,352. The Coast Guard was up to date in its reports on documented vessels, providing complete figures in the bigger-boat categories. In the 31- to 40-foot cruiser category sales fell by eight, to 93, but in the 41- to 65-foot yacht segment sales were up 13, to 69. Sales of 66-foot and larger semicustom and custom yachts rose by one, to 15. Sailboat sales fell by 33, to 139, and they are down 37.1 percent, at 970, through July in the early-reporting states. Just half of the top 10 states for sales recorded more in July this year than they did in the same month last year. Florida led with 3,361 sales, although that was down from 3,446 last year. Texas was second with 3,195 (up from 3,046); Michigan was third with 2,332 (down from 2,450); South Carolina was fourth with 1,476 (up from 1,379); and California was fifth with 1,402 (up from 1,369). Completing the top 10 were North Carolina with 1,321 (down from 1,369); New York with 1,277 (down from 1,661); New Jersey with 981 (up from 899); Washington with 913 (up from 782); and Alabama with 822 (down from 1,002).